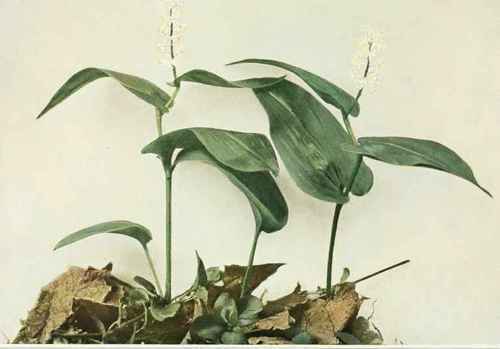 A low, herbaceous perennial with slender rootstock, and slender, erect and often zigzag stem, 2 to 7 inches high, bearing one to three (usually two) ovate or ovate-lanceolate, pointed leaves, cordate at the base and sessile or short-petioled; stemless plants frequent and consisting of a single leaf on a petiole 1 to 4 inches long arising from the rootstock. Flowers white, numerous, forming a rather dense terminal raceme, 1 to 2 inches long; perianth about one-fifth of an inch broad with four spreading, separate segments, which slightly exceed the four stamens in length; fruit a cluster of pale-red, speckled berries, each with one or two seeds. In moist woods and thickets, Newfoundland to the Northwest Territory of Canada, south to the mountains of North Carolina, Tennessee, Iowa and South Dakota. Flowering in May and June. A common wild flower of most parts of New York, especially in the moist cool forests of the northern and mountainous sections.